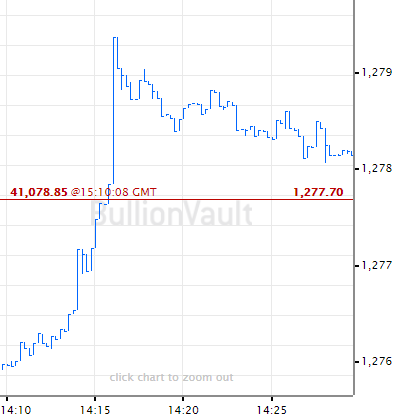 SILVER USE never stops adapting and growing, writes Miguel Perez-Santalla, vice-president for business development at online precious metals exchange BullionVault. Just at the recent Silver Industrial Conference in Washington, DC for instance, I was given gloves lined with microfibers of silver to try. Putting them on, I tested them out for their aim – which is so you can use your smart phone outdoors in the cold winter of the North East Coast. The silver gloves worked like a charm. So will silver's use in a growing range of applications, I believe, after researching further what the expert speakers revealed in DC. Make no mistake. Silver use is rising worldwide. It grew by one fifth over the 10 years to 2012. Investment played a big part in that. 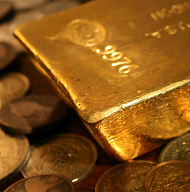 But aside from silver's use as a store of value, it has been called the "indispensable metal" for good reason. Silver's physical properties lend it to many uses. Silver's greatest value to industrial use comes in its conductive properties, as we'll see in a moment. Yes, silver is a thing of beauty as well. So it finds great use in both jewelry and investment bars and coins, which together represented 28% of silver consumption in the year 2012. But for the sake of focus in this special report on silver use – and its outlook – we want to give careful attention to expert projections in certain parts of the industrial sector. Silver use may struggle to keep up its rapid growth of recent years, as new uses are not growing frantically across the board. Take the photovoltaic industry. Here, silver helps convert sunlight into electricity. The solar industry came on like gangbusters in 2008, growing its silver use by 155% that year alone. Growth in the PV industry's silver demand remained voracious up until 2010, when it started to wane. That was because governments both in the USA and Europe started to withdraw subsidies for the sales of solar cells. They had been supporting the market so that the photovoltaic energy industry could compete against the less costly fossil fuels currently in place. 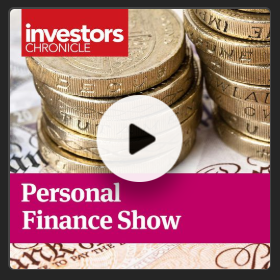 The aim was to give the solar energy industry the boost it needed to get onto a level playing field, in terms of cost, with those existing fuels. Essentially, as time has passed, the photovoltaic industry is coming closer to that goal. But then, enter the year 2011. 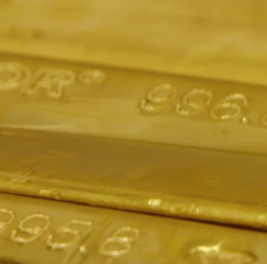 The silver price traded up to new three-decade highs. At the same time, there were fewer and fewer government subsidies for the PV industry. So due to those market changes, silver became expensive and difficult to manage as part of the solar cell manufacturing process. Its price had become too volatile to work with, forcing silver use in the photovoltaic industry to seek better efficiency, as well as seeking out other materials to replace it. Now, in many cases of precious metals use in industry – such as auto catalysts, to reduce emissions from gasoline or diesel engines – you may in the past have heard talk about replacing the metals. In the case of auto catalysts, that would mean replacing one of the platinum group metals currently used. However, suitable replacements sharing the same physical properties as platinum, palladium or rhodium are hard to come by. So throughout the auto catalyst industry, engineers were able to thrift the total usage. But they were not capable of fully replacing those metals. The same has been true of silver use by the photovoltaic industry, but with greater success. Current estimates indicate that PV silver usage, per watt of energy produced by solar cells, will decline by two-thirds by the year 2017. In contrast, the PV industry overall is on pace to grow between 60 to 80% in that same timeframe. 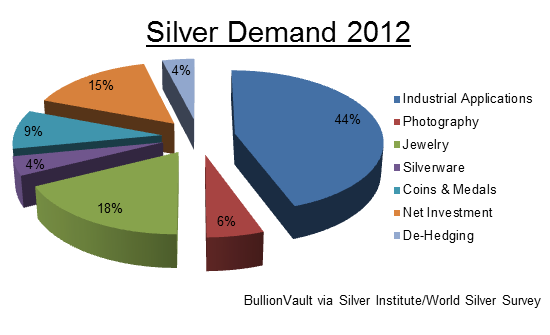 So that will essentially keep us at the same level of silver consumption as now, in 2013. 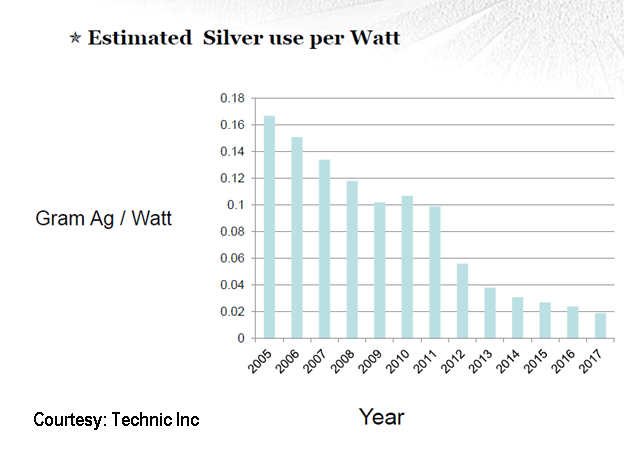 Silver use by the solar energy industry worldwide roughly stands at 51.5 million ounces annually. At this level, the industry consensus is that photovoltaic no longer represents the bull consumer that silver producers once enjoyed. A factor of the photovoltaic industry which is more bullish for silver prices is that solar panels are typically insured to last 20 years. That may sound counter-intuitive. Replacement needs are a long time coming. But an industry expert I spoke to recently from Ames Goldsmith, Randy Klein, noted to me that solar panels are expected to last possibly as long as 30 years, although working at a lower capacity. And what this means is that the silver used in those panels will not be returning to market anytime soon. Unlike the auto catalyst industry, the cycle of recovered metal from solar panels won't see any active stream of silver coming into the market until around the year 2025. Silver's own use in catalysts is meantime expected to keep growing. Catalysts basically help speed up the rate of a chemical reaction, producing the desired end-product without actually being part of it. The primary use of silver in catalysts is to produce ethylene oxide, which then goes to make polyester and other materials, as well as detergents, agro-chemicals and pharmaceuticals. This is a growing market, where industry analysts expect 14% increase in annual production over the next 20 years. Currently China's demand is growing at a faster pace. For silver use as the EO catalyst, it is expected that this industry, which currently uses around 100 million ounces, will go as high as 138 moz by the year 2020. Note, however, that the silver used in this industry does not disappear. The silver catalyst, once used, is reclaimed again after a period of time in use. Per change, there is an approximate loss of about 2% of silver. And with each catalyst in this industry holding around 2 moz of silver, that would indicate a loss of 40,000 ounces per change out. But the truth is that even this metal isn't lost to the market in the end, as it eventually does get reclaimed at a later stage by the refinery. Big picture, as with solar panels, the lack of recovered silver reaching market and boosting supply is the key factor for price longer term. It is claimed that there are 100 million ounces of silver in catalyst form at any given time. As long as this industry continues to need silver to produce this reaction, and create ethylene oxide, then that silver will not return to the market. But if ever there is a scientific advancement where users can either thrift in the catalytic process or remove silver completely, then some or all of that silver may come back. This is always a threat to any commodity, but more so if the commodity is pricier compared to similar metals. Don't get spooked by PV or EO silver use. These two markets only represent 15% of total industrial demand. The other 85% of silver's industrial use comes from electronics, brazing alloy, and other key sectors such as auto parts, medical devices, electroplating and more. And it's here that silver's demand profile is adapting and changing fastest, finding new uses as old technologies are replaced by innovation. Silver's many uses in the industrial sector require it to take many different forms. One of the most significant areas of business is called silver powders. This sector encompasses photovoltaic paste, used in the production of solar cells as we saw earlier. But the rest of the silver powders industry covers multilayer ceramic capacitors, low temperature coal-fired ceramics, polymer inks, pastes and adhesives. Many of these are found on electronic boards as capacitors, circuits, resistors, and in televisions such as plasma TVs, which at one time became an important consumer. Plasma TVs have lost out, however, to the more popular LCD television sets. Because of this, plasma – which at one time was a major use of silver powders – will no longer be a consumer. Panasonic, the last remaining manufacturer of plasma television sets, in fact this month announced the discontinuation of this product due to its unprofitability. But in its place has come the use of silver in the production of touchscreens such as those for computers and handheld devices. Still, the loss of plasma TVs, plus technological advances in other sectors, means a decrease in the use of silver powders is being forecast. 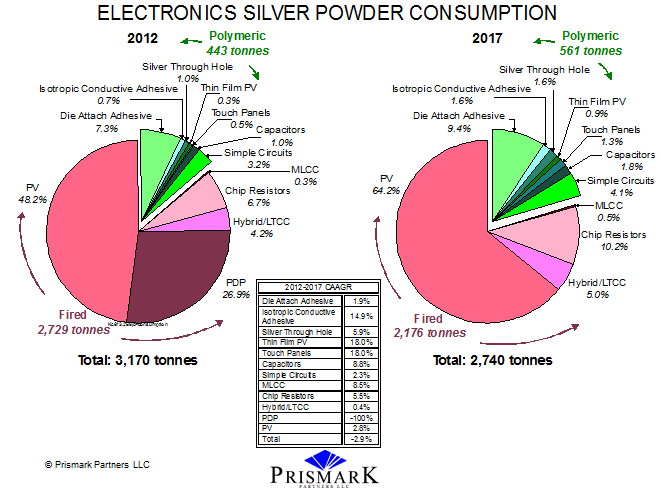 In 2013 the consumption for electronic powders is likely to measure about 102 million ounces, according to Prismark Partners LLC. That is set to drop by 12% over by 2017 to an estimated 90 moz. Might thrifting worsen that drop in demand? Capacity in the production of electronic powder exceeds demand by three times, which keeps output costs remarkably stable, despite silver price volatility, at the currently reasonable level. So it is highly unlikely that any replacement of silver in the specific areas of electronic powder consumption will come to the forefront within the next 10 years. To eat into this use of silver, a competitor product would face significant research and tooling expense to enable them to produce a product of the same caliber. And in other silver powders, not electronic specific, Metalor Technologies indicated at the Washington conference that they expect growth in total annual consumption of these powders from 7.5 million ounces per year to more than 8 moz by the year 2015. This represents a reasonable growth of over 10% in a two-year period. Silver also continues to be in demand in many areas of the chemical industry. Use as a heating element and a connector in parts used for process measurement and control devices is expected to continue to grow. One subset of this industry, the production of formaldehyde, has recently found that using silver in their process reduces their overall costs in their conversion of methane. Silver use in automotive, appliances, and aerospace and battery technology industries also continues to grow. So do electroplating for decorating and industrial applications. New uses in oil refineries, water treatment plants and in the transportation of liquefied natural gas has increased the demand for silver as well. Silver's conductive and change-resistant properties are set to continue finding new applications and uses.